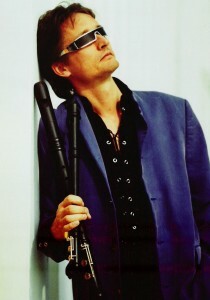 Piers is one of the world's leading recorder players -- check him out! Solo and with his group "Red Priest"
Advance registration is not required. Drop-in is acceptable. - cash or cheque (payable to Edmonton Recorder Society). All ESFRS recorder students will participate. Other students are welcome as auditors, and may participate if time permits. Johann Sebastian Bach with popular jazz standards. Throughout the concert, Flûte Alors! blended organ-like tones of Bach to the contemporary percussive effects in jazz. Featured works include original arrangements of the celebrated Toccata & Fugue in D minor (BWV538) and Passacaglia & Fugue in G minor (BWV 582) by Bach, and well-loved jazz standards Fly Me to the Moon and Autumn Leaves. 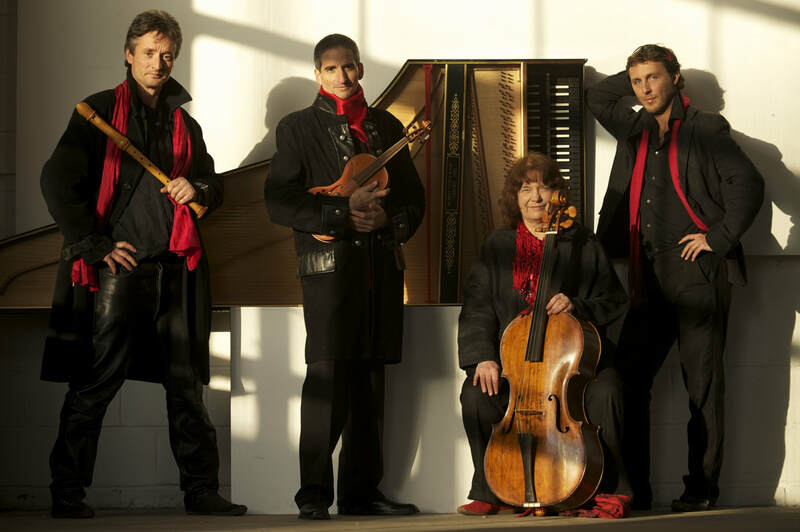 Bach’n’Jazz embarks on an eclectic voyage that traverses the ages, offering a bouquet of sonorities and a palette of colours to the delight of every audience. One: Francis Colpron was back! Tuesday, April 25 7-9 p.m.
No disappointment here! Francis brought two contrasting pieces for us to bring to life; his technical suggestions and dynamic insights will keep us developing as musicians. Wednesday, April 26 7-8:30 p.m.
Tuesday, May 24, 2016 7 - 9 p.m.
What a treat! Francis Colpron, professional recorder soloist, will conduct us in a workshop. 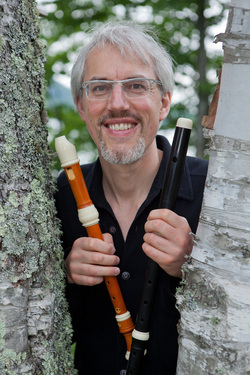 Besides playing flute with the Portland Consort for many years and being on staff at the University of Montreal, he founded a baroque ensemble in 1991, Boréades de Montréal. They specialize in period music on period instruments, touring the world and receiving acclaim for their energy and stage presence. Recorders, viols and other woodwinds are welcome...along, of course, with their players! To access the stage, please enter the Winspear Centre backstage, through the Artists' entrance off the 97 Street parking lot. Expect to sign in and out. Payment is at the workshop, c/o the Treasurer; cash or cheque (payable to Edmonton Recorder Society). Bill urges us to get out of the modern dark ages where musicians play the written score, and only the written score. During the workshop, he showed us how to embellish our pieces by incorporating artistic and creative practices that were the norms of players and composers of the 1500s. The basics are ornaments which Bill classified simply into two categories. First - static embellishments. We can add a grace note, or trills & tremolos around a single note. They are easiest to learn by ear and to think of them as contours – the ups and downs around a note. Secondly – passages. Our favourite example is a relish – delicious when the music presents a perfect fourth. Simply fill in the middle notes – and make it fit the rhythm, eliminating any need for mathematical thirty-second or assorted irregular written notes. As much as Bill encouraged improvisation, he also referred us to ten treatises by the masters of the time. They did write out various ornaments to consider given any particular music setting. For further study, he especially recommended examples by Ganassi whose primary instrument was the recorder. Next, Next, Bill led us through several pieces to integrate those individual flourishes. We followed along as he reviewed the music part by part, thinking out loud where an ornament might fit. Then, of course we played with and without ornamentation, experimenting along the way. We weren’t finished yet...as an ensemble, the music still needs clarity. Our early music predecessors recommended no more than four or five ornaments per part. We discussed who should add the ornamentation -- when and where? Clarity is also enhanced by zones of tension and relaxation, and of the mass (density) of longer notes – new ways to consider elements we already try to interpret. who led a workshop for us in March 2015. We played her composition, Music for a Cavern. This is what she wrote on her website. "Thanks also to members of the Edmonton Recorder Society for being the first group of people to play through the score and show me how awesome and fun it would be to perform this piece live." To hear the piece check out https://soundcloud.com/racheal-cogan/music-for-a-cavern Click on "show more" to find the quote. Success! "Tiny little zig-zags on top of scales and triads." That's the ornamentation way to amaze your audience - and yourself! Ornamentations, in and of themselves, are simple up and down steps around a note.....step by step, Kathleen described several patterns (port du voix, tremblemen, double cadence) and put them into stylistic and historical context - in theory and in musical pieces to play. Better than Suduko, our brains compiled the notes and symbols - our fingers are still catching up, but we all left the workshop inspired! Details from Vince: Our theme will be sprezzatura, or the art that conceals art. A renaissance man/woman of truly noble nature and ancestry was expected to excel at civilized pursuits such as music, without having to try unduly hard. This is sprezzatura, or noble grace and nonchalance. The myth of inherent (and inherited) nobility was pervasive in renaissance society where everyone had his or her place and was expected to keep to it. A different kind of music making was expected from noble amateurs and base professionals; even musical notes were considered good or bad, based on their position. Yet today recorder consort playing is one of the most democratic of musical pursuits, with participants taking a largely equal role in the musical texture as well as in determining tempo and expression. How do we maintain our democratic ideals while entering the imaginative world of earlier times in our search for a historically informed performance? This workshop explores how we can translate the notion of sprezzatura into the performance of music from Anthony Holborne to J.S. Bach (and keep the bad notes firmly in their place). The level is low intermediate and up. If there is interest, part of the second half of the workshop could be in masterclass format, with participants playing the first movement of Bach’s Sonata in F.
In cooperation with Edmonton Symphony Orchestra, Maurice led a workshop for us and offered master classes for several brave souls and small ensembles - right on the stage! We were truly delighted with this extraordinary opportunity. This review fro the Star Observer says this: "Maurice is one of the most thrilling musicians working on the world stage today. The Zurich-based musician is in high demand across the globe both as recorder player and as a conductor.....His command of the recorder – the most widely played of all instruments during the early baroque – is extraordinary. One moment he plays at full throttle with extreme virtuosity and the next he draws the audience in with playing of great tenderness and lyrical beauty." Matthias Maute will be leading a workshop on Saturday, giving a concert with Pro Coro on the following Sunday afternoon at the Winspear Centre. Mr. Maute ran us through some music and helped us play according to the style of the day it was written. Early composers never included that information in the score, so today's players need to gain an understanding from other sources. Most fun, though, was playing Maute's own jazz composition! Stacey Boal was born in Revelstoke, BC. 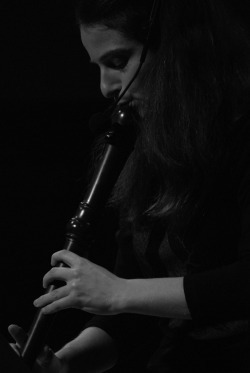 The eldest child in a large musical family, Stacey first played recorder with her parents and their friends. In her teens, she played consorts and took recorder workshops in BC and California, studying with Martha Bixler, Kenneth Wollitz, and Michel Piguet. She also worked for a number of years with James Kennedy in Victoria, both as a disciple and as a colleague. Stacey earned her degree in violin at UBC, and joined the Victoria Symphony in 1976. She continues to play viola in the Symphony and to teach recorder and upper strings at the Victoria Conservatory, and is acknowledged as the foremost proponent of recorders and recorder music in Victoria. This workshop aims to expand your musical horizons with a day-long exploration of fantasias, dances, ricercars, In nomines and other forms of instrumental music from sixteenth-century Europe. Repertoire will include music from the 'bigger players' - Italy, France, England and Germany - as well as repertoire from the less familiar territories of Spain, Holland, Scotland, Poland, Denmark and Norway. Moravian Church, 83 Avenue just west of the Mill Creek Ravine. An afternoon of sacred and secular early music for recorders, culminating with a large ensemble experience in collaboration with Edmonton's premiere sackbut ensemble, the Sackbone Express. About Edmontonian Eila Peterson, B.Ed., A.Mus., M.Mus., Ph.D.
About David Wilson (BMus, MMus) is a Singer, Conductor, Teacher of Singing, Breath Therapist and certified Yoga Instructor. Using postural work, tension release, stretching, metaphorical movement, strength training, breathing techniques, and his experience as a classically-trained singer, he assists vocalists, wind-players and actors in discovering their support, their power, their free breath and their true voice. He focuses on conscious stretching and somatic breathing to build focus, energy, and good health. As a musician, conductor, teacher and singer, David’s classes focus on the breath’s ability to intensify the poses, enhancing both our core strength and inner tranquility. David Wilson also was ERS's orchestra leader in 2009.